Plans to convert a former kitchen showroom into a taxi booking office have been snubbed over noise fears. 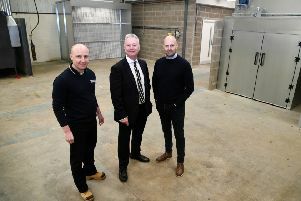 Earlier this year, an application was lodged with Sunderland City Council for Unit 1 at Rydean Works. The area, off South Street, in Newbottle, Houghton, provides units for a range of businesses. New plans included opening a private hire taxi office between 7.30am – 11.30pm, Monday to Friday and 8am-11.30pm on weekends and Bank Holidays. According to planning documents, the business planned to use existing spaces on the site to serve taxis. This included three taxis operating on site with a potential to increase to six. During consultation, one letter of objection was lodged from an Elm Place resident over potential littering and noise concerns. Council planners also raised concerns the taxi office would impact neighbours due to noise from engines, car doors and “conversation” between drivers. And due to existing deliveries from a nearby takeaway, a report adds, a taxi office operating late into the night would create an “intensification of the comings and goings on site” to the “detriment” of neighbours. A decision notice was published on April 12 which stated the proposals clashed with planning policies. The applicant can appeal the decision if they choose to do so.